GISS was late this month. NOAA is also out - numbers here. GISS is down from 0.93°C in May to 0.79°C in June. This is more than the fall of 0.06° in TempLS, and a little more than the posted, 0.1°C fall in the NCEP/NCAR index. 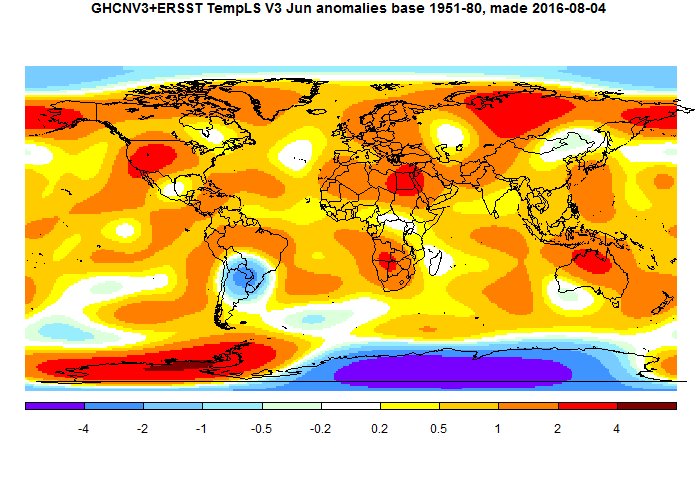 As Sou has noted, it is still (just) the hottest June in the GISS record. TempLS mesh, reported here (as of 8 July, 4306 stations), was down from 0.746°C in May to 0.682°C in June (base 1961-90). This shows some easing the post El Nino decline also seen in the NCEP/NCAR index (down 0.1). In fact, TempLS grid rose slightly, from 0.70°C to 0.74°C. The SST component of TempLS also rose. The satellite measures varied; UAH6 Lt was down 0.21°C, but RSS only 0.06°C. The one notable cool spot was near Paraguay, but both high Arctic and much of Antarctic were cool. Also US, S America around Paraguay, and a spot in the N Pacific. Warm in W US, around Egypt, Alaska and part of Siberia. The breakdown shows only Antarctica (cool) as unusual. The different coverage of Antarctica is likely to lead to discrepancies, as with TempLS mesh and grid. In other news, 2016 JAXA Ice briefly lost, then recovered its lead. It is likely to soon fall behind 2012. The NCEP/NCAR index dropped again in June, from 0.471°C in May to 0.369°C in May (anomaly base 1994-2013). The drop is smaller than previous months, and may be a sign of levelling. We are now back in average to about Sept 2015, the first small rise of the El Nino. Cold in E Europe to W Siberia, most of US except E Coast, and a band of cold from Labrador/Greenland into the N Atlantic. Warm in Arctic and Canada, and the reanalysis still has the ENSO region fairly warm. Globally, the temperature rose somewhat at end of month. In other news, UAH V6 also dropped considerably, from 0.55°C to 0.34°C. Arctic Sea Ice recovered somewhat (relatively), and 2016 is now not quite in the lead. Big drops in the last few days, but looking back through the record, this seems to be a feature of the end of our financial year.